Darjeeling, June 15 (PTI): Protesters and paramilitary forces battled with stones in this fog-shrouded town after police raided premises linked to Gorkha Janmukti Morcha chief Bimal Gurung and claimed to have recovered hundreds of weapons. The GJM, whose demand for a separate Gorkhaland has put it on a collision course with West Bengal Chief Minister Mamata Banerjee, retaliated by calling for an immediate and indefinite shutdown in the hills. ”The state government is indulging in politics of witch-hunting,” Roshan Giri, the GJM’s general secretary, told PTI from Delhi, where he is camping. ”The police and the state government are provoking us to call an indefinite strike in the hills. We will inform the Centre about the atrocities of the state government. We have called an indefinite shutdown in hills from today,” Giri said. 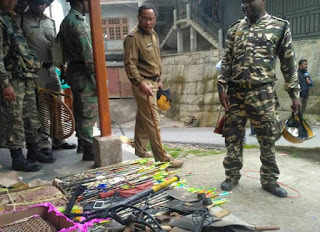 Police said more than 300 weapons, including arrows and explosives, had been recovered from premises connected with GJM boss Gurung. Gurung’s residence was not raided. ”Some of the premises of Gurung and other GJM activists were raided. We conducted the raids on the basis of concrete information,” a senior police officer told PTI on condition of anonymity. Giri, who is in Delhi, dismissed the claims of a weapons haul. “What have they found? Khukri is part of our tradition, what is the harm in keeping it? Bows and arrows are traditional weapons. They were meant for students for archery competition,” he said. ”The GJM is being targeted as we are fighting for a separate state. The police and the state government are trying to frame false cases against us,” he alleged. Giri said the state government had created the present crisis in the hills. “They want to suppress us using huge police force,” he said. The raids came on the fourth day of the GJM-sponsored indefinite strike in offices of the state government and the semi-autonomous Gorkhaland Territorial Administration. The GJM's call for a separate Gorkhaland has gained momentum after six other hill parties extended their support and unanimously passed a resolution backing it on Tuesday. Prominent among the six parties to join GJM is the Gorkha National Liberation Front (GNLF), which broke its alliance with the ruling Trinamool Congress. Protesters and paramilitary forces battled with stones in this fog-shrouded town after police raided premises linked to Gorkha Janmukti Morcha chief Bimal Gurung and claimed to have recovered hundreds of weapons. The GJM, whose demand for a separate Gorkhaland has put it on a collision course with West Bengal Chief Minister Mamata Banerjee, retaliated by calling for an immediate and indefinite shutdown in the hills.